"Ah, I remember when this was all giant iPhone adverts..."
The poorly designed roundabout outside Waterloo Station is to get a revamp, courtesy of Deborah Saunt and David Hills Architects. The up-and-coming firm won a design competition organised by the South Bank Employers Group with their vision to make the unlovely space more appealing and easier to navigate. The plans include improved walking and cycling routes and a facelift for the IMAX cinema which will see the current advertising billboards replaced with an interactive screen. The masterplan is dubbed 'Waterloo City Squre', a name that we doubt will catch on. Why not bite the bullet and call it IMAX square after the one salient feature everyone will use it for? ‘Waterloo is a meeting place for people, journeys and identities. We hope to create seamless connections at ground level to allow dignified access for everyone to all local spaces,’ commented Deborah Saunt, co-founder of DSDHA in the Architect’s Journal today. 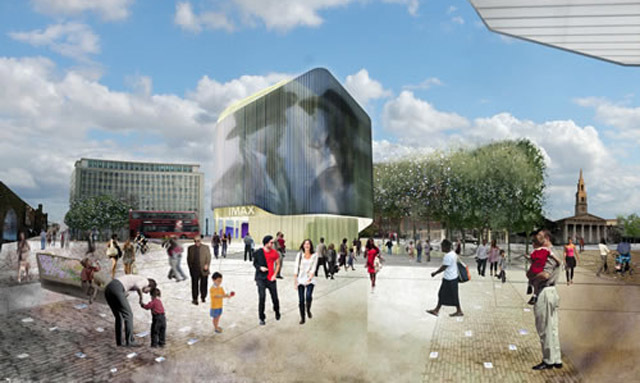 The judging panel was chaired by Peter Bishop, Group Director of Design, Development and Environment at the London Development Agency, but over 1700 people in the community took part in the consultation to give a local view on how they wanted to see Waterloo improved. DSDHA fought off stiff competition with their plans to make life that little bit nicer for Waterloo pedestrians and less bewildering for visitors trying to negotiate a busy transport area. The DSDHA plans will give the roundabout three two-way approaches for traffic and one pedestrianised, though London’s beleaguered motorists will be delighted to learn that the scheme won’t duplicate the traffic chaos cased by the closure of one side of Trafalgar Square, as Saunt is working on a traffic-neutral solution with an engineering consultancy. Getting around on four wheels won’t be any worse, but it will be better for two wheels and feet with wider pavements, improved connections to the station and opening up of river views through the railway arches. The Waterloo makeover is just a part of larger improvements and cleaning up of the Thames-side area, which should make the South Bank a brighter place to be for residents, commuters and visitors.